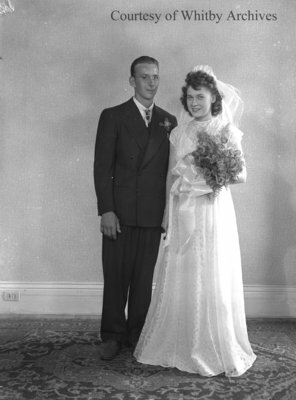 A black and white large format negative of Mr. and Mrs. Ricard on their wedding day, September 27, 1947, in Green River, Ontario. This negative has started to degrade. Mr. & Mrs. Ricard, September 27, 1947, Marjorie Ruddy. Whitby Archives A2013_040_483.